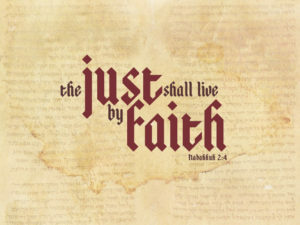 The book of Habakkuk begins on a note of despair as the prophet views the conditions around him, and dialogues with God. Then in the middle part of the book God brings him to discover the truth that “the just shall live by his faith” (Habakkuk 2:4). I believe this truth must have revolutionized the prophet as it did Martin Luther through whom it spawned the reformation, and in the last chapter there is a 180-degree turnaround in Habakkuk’s outlook, which has changed from despair to that of hope, joy, and victory in God, regardless of the circumstances! May every one of us learn this lesson that the future is as sure as God Himself and as bright as the promises in His word! And they set it to music with a flare. We’ll be revived and not get bored. The people found His praise to be fun. God came from His hiding place power to render. And measured the earth we are told. And removed its foundations I would say. For Your destruction of the wicked I will wait. And I can’t get my food to suit. He knows best and I make Him my choice. I make spiritual progress and with God I talk. Scripture quotation is from the New King James Version copyright 1982 by Thomas Nelson Co. used by permission.